Egypt, Algeria and Italy say that there must be a quick solution in Libya and that time is critical, they announced at the end of trilateral talks on Sunday. The foreign ministers of the three countries held talks on Libya, hosted in Cairo. 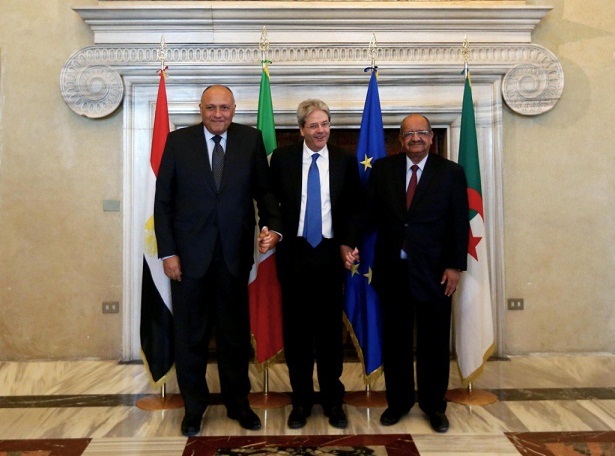 In a joint press conference aired on Egyptian state television, Italian Minister Paolo Gentiloni said the talks are a “a message of support” to the creation of a unified government in Libya, representing all Libyan factions. Gentiloni said, however that the political solution must be backed by all parties. The time to push for a “final solution” involving all conflicting parties in Libya “is very limited”, the Italian minister added. The three countries say that this unity government must receive the necessary support from the international community. Egypt’s Minister Sameh Shukri said that there must be a balance between working on the political framework which may take some time to crystallize to form the national unity government and working on supporting the “legitimate” government of Libya and its army. “We cannot waste more time,” the Egyptian foreign minister said. Meanwhile, Algeria’s Minister Delegate for African and Maghreb Affairs Abdelkader Messahel said “we are trying to reach a fair solution” that leads to a stable Libya. He added that what happens in Libya is a “vital security matter” for Algeria. Algeria and Egypt are Libya’s western and eastern neighbors, respectively. Libya has been caught up in unprecedented violence since mid-2014, when army general Khalifa Haftar declared war on Islamist forces within Libya, prompting nationwide militant fighting. Libyan capital Tripoli has fallen under the control of the Fajr Libya or Libya Dawn Islamist militia in August 2014. Meanwhile, Egypt and the international community only recognize authorities based in the eastern Libyan city of Tobruk. The Libya crisis has affected several Egyptians, who have been caught up in fighting between different Libyan factions. In February, Egypt’s air force conducted air strikes which it says hit militant targets, after the beheading of 20 Egyptians inside Libya at the hands of militants believed to belong to a Libyan division of the Islamic State fighters. Egypt, Italy and Algeria have closely followed developments in Libya and the trilateral talks today, are the second round of talks between the trio in less than three months, after Rome hosted talks in April.